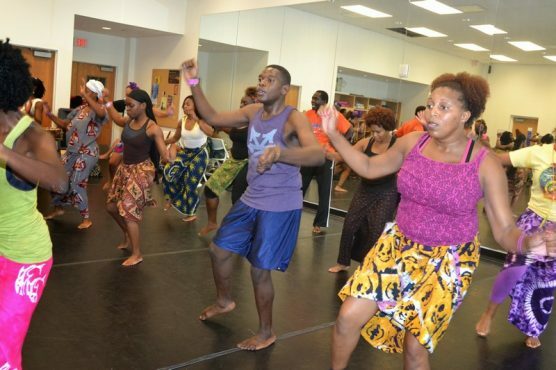 African Dance Class - Delou Africa, Inc.
All classes are held at the Little Haiti Cultural Complex, 212-260 NE 59 Terrace – Miami, Fl 33137. Women: Lapa-fabric that wraps around your waist 1-2 yards according to your size (wrap skirt or sarong) leggings underneath and a comfortable fitted top. Note: Class Discount Cards not valid for workshops and special events. *All Dance / Drum classes participants are required to pay $20 annual City of Miami Registration Fee. Payment for registration, community classes, workshops and special events may be made via cash or credit card. Note: Class schedules are subject to change. Please join our Mailing List for the latest news and updates. Our mission is to bridge cultural gaps and preserve African culture by facilitating artistic education through traditional African dance, drum, music, and history. Join Our Mailing list and receive the Latest News and Event information from Delou Africa! © 2017. Delou Africa, Inc. All rights reserved. || Web Site Designed by SIRIUS WEB SOLUTIONS.